PRODUCTION EXPO 2014: LA based DJ/productionduo Christian Rich have become one of the most sought-after hip-hop, electronic pop and R&B producers working today. 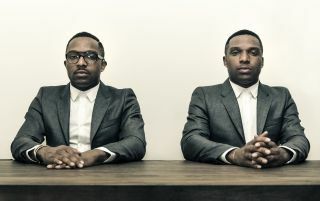 Brothers Taiwo and Kehinde Hassan have produced tracks for numerous high-profile artists in the US, including work on Drake's number one album Nothing Was The Same (working on the intro vocal to Pound Cake) and Earl Sweatshirt's number one rap album Doris. Which music producers first influenced you? "When we came back to the States in 1990 from Nigeria the first few hip-hop artists our sister played us were Souls of Mischief, Tribe Called Quest, Ice Cube, and Pharycde.Then we began to search out other artists and were influenced by the productions of Pete Rock, Dr. Dre and DJ Premier." When did you get into production yourselves? "As kids we had a rap group, but that was just a passion project. We eventually got into production because that side of the music attracted us more - the jazz samples, heavy James Brown drums and 808s. As we got older, producers like Pete Rock, Jay Dee and Pharrell began to get known. We saw that producers could be just as well known as the artists, so we cultivated ourselves in that vein." "Eventually Shae of N.E.R.D heard our music from a mutual friend and played it for Pharrell - that injected us into the Star Trak camp"
Did you try releasing any of your own tracks? "At college we linked up with a big NY producer and placed songs with Lil Kim, Foxy Brown, Clipse and some other artists. After we graduated we moved to NY to pursue our own productions. As time went on we began writing songs just like when did when we were kids in the 90s - I did vocals and worked together with Ken on the production. We started to get label attention and a solid fan base in NY around 2008/2009." Why didn't you follow that attention up? "Eventually Shae of N.E.R.D heard our music from a mutual friend and played it for Pharrell - that injected us into the Star Trak camp. As time went on we didn't really want to be artists anymore, so we went back to production and began working to craft songs and albums for some of the best artists of this time. Because they already knew of our own productions it allowed them to have confidence in our musicality." You see yourselves as 'music designers'. Is it important to be ahead of musical trends? "Yeah, you have to spark the mind to create trends so [that] you won't be pigeonholed by any particular trend or idea. We've even taken it a step further and call ourselves 'creative directors' now. We don't like titles, but with all the things we have going on that's more fitting." What's the process when discussing potential sounds and styles with a particular artist? "Nowadays a lot of artists are also producers, so they already have a good idea where they want the sound to go. At this point in our careers they come to us for a certain sound. We're really into jazz chords and big drums, but we're also really good with dark, eerie sounds like the Centurion track we did for Earl Sweatshirt, or the new one I just sent Earl which is even darker." How much involvement does the artist usually have in the production process? "A lot of times we'll have the track done and the artist will add what they want here and there. We don't mind them getting involved because it allows the album as a whole to have a cohesive sound, which I think is very important." "We're most proud of our work with Childish Gambino and Earl Sweatshirt. I think with those productions you get to hear some of our attitude and a little more emotion"
Which sounds do you currently feel are typical to the current pop/hip-hop market? "808 claps and kicks are always typical, but then that's what makes hip-hop our sound. We can go anywhere around the world and hear that influence. The Bay sound is in right now, using 90s house organs. I'm into that sound you hear on the Jeremih record Don't Tell 'Em. Pop on the other hand borrows from hip-hop a lot and tends to get very generic. I've noticed the pop sound is into bad voices; the worse you sing the more I have to hear it in every store and commercial." What software do you use in the studio? "Logic 9, although we have Logic 10 but haven't gotten round to using it yet. Our go-to software is Native Instruments, particularly Massive and Absynth, but we also like the Arturia catalogue. FL Studio is synonymous with the current hip-hop market. Edits start on Logic or we create the main sequence on Logic then add sounds from the Dave Smith X4." What production work are you most proud of and is there anyone you'd love to work with? "We're most proud of our work with Childish Gambino and Earl Sweatshirt. I think with those productions you get to hear some of our attitude and a little more emotion than the others we've done. In terms of who we'd like to work with, this is always a tricky question because it's not a music person. It's designer Philippe Starck. He designed Mama Shelter Hotel in Paris and some dope chairs we have." How do you divide roles in the studio and are there ever disagreements? "Every single day and moment - that's how we get the best stuff out. It's varied over the years but now it's more like one of us starts a demo then the other finishes it. Sometimes we just do tracks on our own and play them to each other like, 'Hey listen to this.'" Finally, what projects do you have coming up? "We just finished a song for Wale's new album and Kendrick wrote to a track of ours. We're working on our first LP now after releasing our EP SS14 back in July. There's more to come."